We listed up our recommendations for you ! MonotaRO offers Masking Tapes and more. You can buy them anytime from our Singapore online store. KAMOI KAKOSHI Masking tape for Vehicles Coating, "Kabuki S"
Color: Blue, Base Material: Japanese paper, Tape Length (m): 18, Tape Thickness (mm): 0.09, Adhesive: Acrylic, Elongation (%): 2.8, Tensile Strength (N/15mm): 50.6, Adhesive Power (N/10mm): 2.15, Purpose: For sealing , For sealing , Caution: Please note that the paper may tear occurs, depending on the type of sealant adherent and working conditions, and primer. If the tape may be too much adhered, depending on the type of the adherent, Do not put sticked for a long time., Please note that the paper may tear occurs, depending on the type of sealant adherent and working conditions, and primer. If the tape may be too much adhered, depending on the type of the adherent, Do not put sticked for a long time. Base Material: Japanese paper, Tape Length (m): 18, Tape Thickness (mm): 0.11, Elongation (%): 4.5, Tensile Strength (N /18mm): 80.41, Adhesive Force to SUS (N/18mm): 2.65, High Speed Unwinding Force (30m/min): 4.41, Purpose: the masking for, at the time of filling up the bathroom, sash sealant joint , Caution: Please remove it the before joint surfaces get dry. See more results of "Masking Tapes"
Best Hit Scotch Super Strong Double-Sided Tape Premier Gold and Versatile ! Best Hit White Masking Tape and Soft Masking Tape ! Want Automotive Paint Masking Tape No.7235 and Masking Tape For Painting No.720 Green ? Click Here. 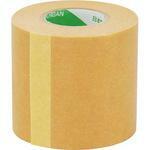 Check our Masking Tape No.7286 For Sealing and Masking Tape for Sealing here as well ! Paper Masking Tape and Crepe Paper Masking Tape and other alternatives. Our choice for you, Craft Adhesive Tape No.246 and Nephron Tape. 3M Masking Tape No.243J Plus and 3M Masking Tape No.243 and many other best selling products.